Goodreads Summary: How do you defy destiny? I was really looking forward to this book. First of all, the cover is gorgeous, the synopsis sounded interesting, and I love mythology. 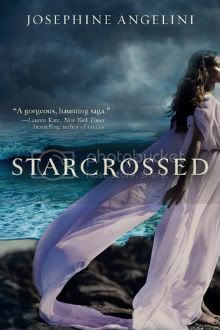 However, Starcrossed didn't turn out to be everything that I was expecting. Helen Hamilton leads a fairly ordinary life. She goes through the motions of school and chores and tries to avoid attracting any unnecessary attention. But all of that changes when the Delos family moves to Nantucket. When Helen finally sees Lucas, she hates him instantly; so much, in fact, that she literally flies into a rage and attacks him. And that is only the beginning. She can't bear to be around any member of the Delos family, and the feeling is mutual. Yet with one near-death experience, everything changes. Soon Helen and Lucas don't know if they are destined to be mortal enemies or star-crossed lovers. Helen has a lot to learn from the Delos family, about herself and her history, but when she finally learns the truth, will it be too much to handle? I really wanted to love this book. After hearing some of my friends talk about it, I thought I would love this book. But I couldn't. The mythology was interesting, and I enjoyed learning the truth about Helen's heritage and abilities along with her. Similarly, I liked getting to know the Delos family and their talents. The book was certainly never dull; there was always something new to discover or another sweet moment to experience. Yet even though the book was good, but it didn't live up to my expectations. I rarely ever say this, because so many books have similar plots (and let's face it, I read similar stories because that's what I like), but this book reminded me of Twilight. It took me a long time to see past the similarities; it wasn't the overall story that had things in common, it was the details. I think I could have overlooked a lot of this if the mythology had been stronger, but instead I spent more time trying to figure out what was going on for the first part of the book than being drawn into the story. That being said, I did enjoy this book. The second half of the book was much more engaging than the first. Aside from one of the last revelations, I felt that some important questions were finally answered. However, there is not much of a sense of closure; instead, a lot of threads are left to be addressed in the sequel. Even though it took a while to get into this book, I do plan to read the next in the series and see where Angelini takes this story. In Starcrossed, Angelini gives a unique twist to Greek mythology and uses it as a backdrop to two teenagers caught in an ill-fated love. I'll be curious to see what happens next! Good review! I have this in my TBR pile, I too love Greek mythology and had read some pretty good reviews with this one! Hoping I will be able to enjoy now though. If it's got similarities to Twilight, I have my doubts, but will read with an open mind! Thanks for your review. I have this book on my Kindle, but I keep putting it off. I will get to it eventually, but I am worried it will take me awhile to get into as well for the reasons you mentioned. I have it and it is on my to read list...soon! Hey Crhistin! Stopping back again, hopefully you'll see this comment, but did you get my email yesterday saying that you won my contest? Be sure to check your spam folder! Please contact me asap to claim your prize!